On 26th April 1987 the future of 120,000 people living near to the Chernobyl Nuclear Power plant was forever changed when Reactor 4 exploded. Regarded as one of the worst nuclear catastrophes in history, the disaster made headlines everywhere and led to the evacuation of 189 towns and villages who were within 30 kilometers of the explosion, including Pripyat. Thirty one people sadly lost their lives and many more were affected. Today, the area is still considered dangerous, in fact experts say it won't be habitable for humans for 20,000 years. 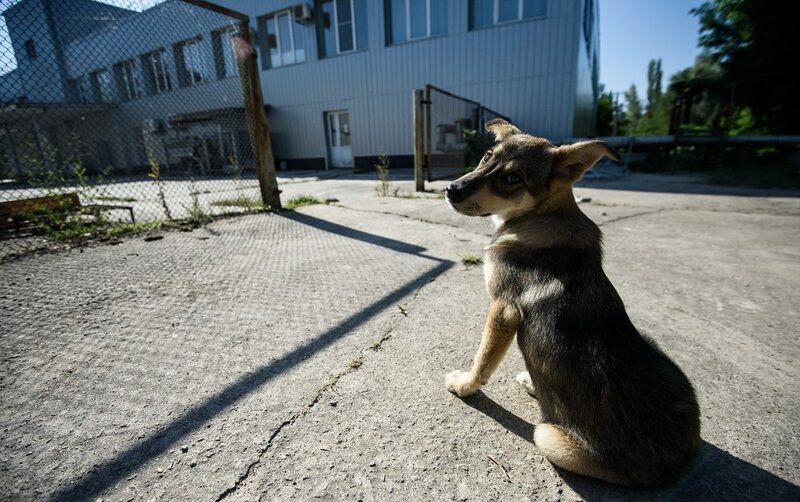 But Chernobyl and nearby Pripyat remain home to hundreds of stray dogs, some of whom are decedents to the many dogs who were left behind when families fled thirty years ago. An organisation is now campaigning to protect the stray dogs living there and the workers at the nuclear power plant from any diseases potentially passed on from wild animals, such as rabies. Working together, FOUR PAWS and the American NGO Clean Futures Fund (CFF) are aiming to vaccinate and neuter the dogs living within the zone in an attempt to protect both the strays and workers, while also reducing the population of dogs in a sustainable way. The stray dogs living in the exclusion zone will be caught before being released after being treated. Before the start of the project, extensive research was done in order to minimize the health risks that the environment poses to the teams sent by both organisations. Lucas Hixson, co-founder of CFF says, "We are following strict health and safety protocols to ensure the safety of our team. As part of this, it is mandatory to wear appropriate clothing to ensure that the team is protected from the radiation levels. Furthermore, the stray dogs of Chernobyl will be thoroughly washed and scrubbed before every medical treatment to reduce the risk of contamination. "There is also no risk presented by the surgery and open wounds. The radioactive contamination of the dogs is very low so that it poses no risk to humans." Julie Sanders, International Director of Companion Animals Department at FOUR PAWS says, "Rabies is not only a risk for animals but also for humans. By vaccinating the stray dogs, we are also protecting the 3,500 nuclear power plant workers who come into contact with the dogs and look after them. "By neutering the strays, we will also achieve a long-term reduction in their population, improving the welfare of the dogs. This is important because their chances of survival are greatly reduced if their numbers increase due to lack of food and shelter in the extremely cold winters. "The abandoned pets and later generations survived within the radioactively contaminated area, even though it was declared open season when soldiers were sent in to shoot the animals after the nuclear catastrophe. Originally, the dogs retreated to the surrounding woods after the exclusion zone was established, but packs of wolves and food scarcity forced them back to the abandoned city and towards the still-active nuclear plant. There, the workers began to feed the dogs and they have stayed ever since." Ukrainian FOUR PAWS vet, Oleksander Senchuk admits it is an ambitious plan with the team planning on completing the project within a two week period, treating injured animals while they are there also, but says, "It is a very ambitious plan, but given the experience that we have accumulated over the years, we are confident that we can manage it."